Duke beats Baylor…..61 to 59!…For their 4th NCAA March Madness Mens College Basketball Championship! It wasn’t a blow out….. Both of my two son’s….. who care about basketball …..have given their compliments to the team!…. Coach K….should be a happy man! And one of his teams does it again! From the New York Times….The Quad……Blogging…. Note…. the original post was incorrect…It had the win as the Tenth Championship…..that is incorrect…This is Duke’s tenth trip to the Championship game and they are 4 and 6 for the games overall……..
Duke beats West Virginia 78 to 57!…..Will play Butler on Monday for the Championship! Folks I never thought Duke would get this far! But the Dog has just come back from watching the Duke Blue Devils school West Virginia….. The will now show up in the Lucas Oil Stadium in Indianapolis for their 11th NCAA Mens College Basketball Championship…….. This is their first since 2001……..
Duke’s Singler, Scheyer and Smith scored 63 points combined in the win……..
Duke 13…. 3-pointers in the game…….. The best part of the game was me breaking my oldest son’s chops! 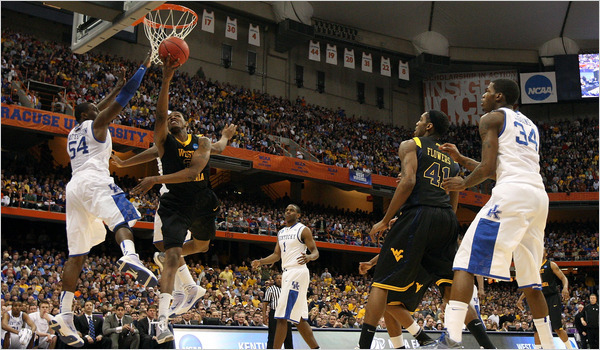 The Final Four of the NCAA March Madness College Mens Basketball Championship…. These are your Final Four Teams Folks….. The Wiki Backrounder on the whole Tournament…….here.…. They played like they were lost…..
People are going take a hit on this one….. The team to beat got beat by themselves……. Injury replacement Joe Mazzulla scored a career-high 17 points in his first start this season and West Virginia handled a cold-shooting Kentucky team stocked with future NBA players almost from the opening tip for a 73-66 victory in the East Regional final Saturday night. Mountaineers coach Bob Huggins, back with his alma mater, is in the Final Four for the first time since taking Cincinnati in 1992. It’s an even longer stretch for West Virginia — Jerry West was the star of the team 51 years ago, and not yet a Hall of Famer or NBA logo. For freshman sensation John Wall and the young Wildcats, a scintillating season ended with a clang. They were awful from 3-point range, missing their first 20 attempts and finishing a stunning 4 of 32 (12.5 percent). DeAndre Liggins finally hit a 3 with 3:29 left to end the drought, but by then it was too late. West Virginia went the other way, making eight 3s in the first half without a 2-point basket. Kentucky coach John Calipari led his talented team to the regional final in his first season, restoring the Wildcats among basketball’s elite after several underachieving seasons. But they showed their inexperience in this one, misfiring all night after using a swarming defense to beat tournament darling Cornell in the round of 16.